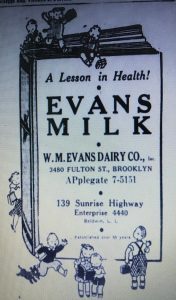 W. M. Evans Dairy Co., Inc., 3480 Fulton St., Brooklyn, N.Y. 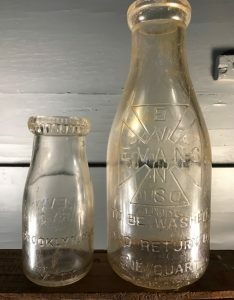 The early history of the WM Evans Dairy is described in a January 9, 1925 story in the “Interlaken Review”, a local paper published in Senaca County NY. The story was written around the time Evans joined The Dairyman’s League Cooperative Association. 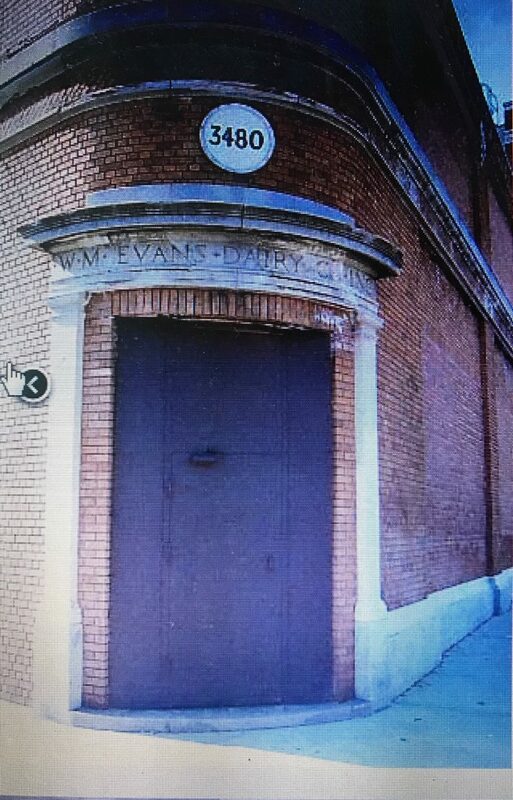 The Evans Dairy was founded in 1878 by the late WM Evans who operated exclusively for a time in the Williamsburg Section of Brooklyn. His son, William C Evans bought the business in 1904 and launched out on his own hook with seven wagons and ten horses. Mr Evans rapidly built up trade. Today the company has 226 retail routes. The concern was incorporated under its present name in 1913. Willet (or sometimes Willet M) Evans, milk, first appears in the 1880 Brooklyn City Directory with a Bushwick Avenue Address. Over the next 30 years his listed addresses in Brooklyn included South 6th St and Keap Street, both located in Williamsburg. Willet C Evans is listed with Willet M Evans starting around 1906. The 1922 Copartnership and Corporation Directory for Brooklyn and Queens lists the company as a NY corporation with WC Evans named as President and Treasurer. By this time they had moved to 32 Lexington Avenue. The Dairyman’s League Cooperative Association, Inc. has purchased the business and properties of the W M Evans Dairy Co. which has a large retail family trade in Kings and Queens Counties. The transfer will take place on January, 21, 1925. G W Slocum, president of the farmers association says that the twelve county plants embraced in the deal will be retained and operated by the association…The association has contracted to sell the city end of the business to Borden’s Farm Products Co. Apparently the city end of the business became a subsidiary of Borden’s as a result of the sale but it appears that the Evans family maintained a significant ownership stake. According to various newspaper clippings, W C Evans is still the president in 1927 and the company continues to advertise themselves as W M Evans well into the 1940,s. The company moved to 3480 Fulton Street in the late 1920’s and this appears to be their primary location through the late 1940’s. Most if not all advertisements through this period reference this location. In the late 1920’s and 1930’s the company is also expanding into Long Island. Several advertisements during this period in the Brooklyn Daily Eagle mention Long Island locations in Rockville Centre at 239 Merrick Road and in Baldwin at 139 Sunrise Highway. The Rockville Centre advertisement is dated 1928 and the Baldwin advertisement is dated 1938. It’s not clear whether both operated at the same time. In 1949 the business sold the the three buildings located at the Fulton Street location. The sale is documented in the August 22, 1949 issue of the Brooklyn Daily Eagle. W M Evans Dairy Co., Inc. has sold the three 2-story brick buildings used as a milk plant at 3480 Fulton St., on an irregular plot 31×100, to Fulton Dairy Corp., an affiliate of Holland Farms. After the sale, the company is no longer listed in the phone book and I can’t find any advertisements for Evans milk. However the actual end of the business did not come until the mid-1960’s. 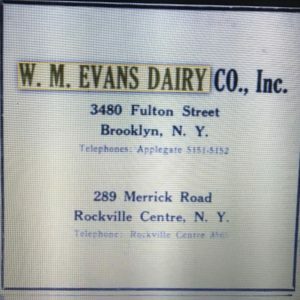 A 1971federal indictment charged that during the mid 1960’s, Joseph P Fingst, at the time a Supreme Court Justice in NY, conspired with others to take control of the W M Evans Dairy Co. and the Evans-Amityville Dairy, Inc. The indictment went on to allege that the defendants sold off the dairy’s assets and pocketed the cash before causing the dairy to file for bankruptcy. The indictment described the Evans Dairy Business at the time as a group of corporations whose stock was closely held by the Evans family. The building that housed Evans Dairy at 3480 Fulton Street remains in existence today. 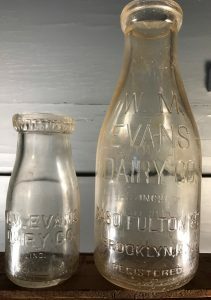 I found both a quart and half-pint Evans bottle. An Owens Illinois Glass code on the base of the half pint indicates a 1936 production date. This fits within the time frame that the company was located at 3480 Fulton Street. Previous Previous post: Amityville Creamery, Inc./Evans-Amityville, Amityville L. I.